Hong Kong is lying on the delta of the Pearl River in southern China. It is one of the easiest ways to get into China for international tourists. 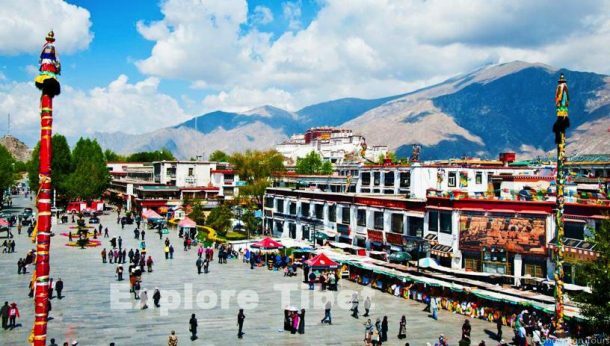 A major international tourist destination itself, traveling to Tibet from Hong Kong is one of the easiest ways to travel to Tibet, the roof of the world. And there is a multitude of routes to take to get to Tibet, giving you time to spend in some of China’s most spectacular cities along the way. While there are no direct trains from Hong Kong to Lhasa, it is easy to get a train or flight to many of the cities in China in order to get to Tibet. The trains to mainland China run from the Hung Hom Station in the Kowloon area of Hong Kong, on the mainland section of the city, running to major cities such as Beijing, Guangzhou, and Shanghai. Flights also run these routes from the Hong Kong International Airport, as well as to other gateway cities such as Chengdu, Xi’an, and Chongqing. Flights from Hong Kong to Beijing run daily, with more than 20 direct flights from a number of international and Chinese carriers, including China Southern, Air China, and Hong Kong Airlines. The flights take around 3 hours 35 minutes to get to Beijing Capital International Airport and cost from around US$ 242 for a one-way economy ticket. Traveling to Beijing from Hong Kong by train, you have two options, the faster high-speed trains, of which there are two pairs running between the cities, or the slower through trains that run at normal speeds. The normal trains are sleeper trains, which run every other day both ways, taking around 24 hours to reach the Chinese capital. The high-speed trains are the better option, though more expensive. The high-speed trains cost around 1,00 yuan for a second-class seat and reach Beijing in under nine hours. Trains to Lhasa from Beijing leave daily from the capital and take around 40 hours to make the 3,757-kilometer trip. While the train journey is longer than flying, it is a lot cheaper, costing just 720 yuan for a hard sleeper berth (second-class), and you have the advantage of traveling over the vast Tibetan plateau to Lhasa, with its stunning landscapes and scenery. There is only one direct flight to Lhasa from Beijing daily, which takes around 4 hours 30 minutes to reach the Tibetan capital. Flights cost from around US$ 450 for an economy ticket, which is more than four times the price of the train, but much faster. Whichever transportation you pick it is quite convenient to get to Tibet from Beijing. Guangzhou is the closest major city to Hong Kong, and one of the best ways to get to Lhasa. There are around 12 pairs of normal trains and over 30 pairs of high-speed trains that run between Hong Kong and Guangzhou daily, with the normal trains taking around two hours while the high-speed trains make the trip in under 50 minutes. Flights to Guangzhou from Hong Kong run just twice a day from Hong Kong International Airport, offered by the Cathay Dragon airline. The flight is just an hour long, and costs from around US$ 131 for an economy one-way ticket. Trains to Tibet from Guangzhou run daily, taking around 55 hours to make the 4,980 -kilometer trip, traveling up the entire length of China to Qinghai Province before heading down over the plateau to Lhasa. The cheapest berth is the hard sleeper, which costs around 865 yuan for the trip. 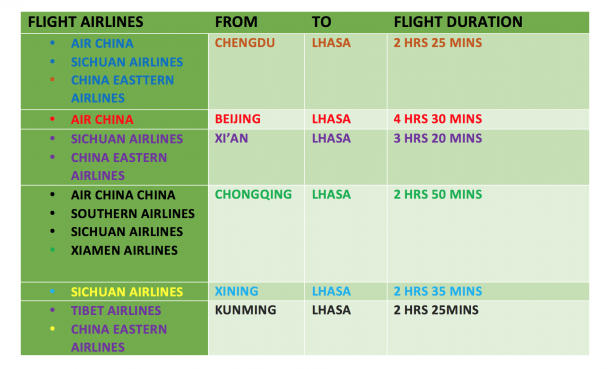 Flights from Guangzhou to Lhasa run three times a day, only one of which is direct. The other two flights have a stopover in Chongqing along the way. The flights take around 6 hours to get to the Tibetan capital, plus one hour for the stopover flights, and cost from around 3,000 yuan for the economy class tickets. Traveling to Shanghai from Hong Kong can be done by train in around 19 hours by normal through a train, while the high-speed trains make this trip in around 8 hours 20 minutes. The cost is much higher though, starting at around 1,000 yuan for a second-class seat. Shanghai is a popular destination for flights from Hong Kong, with more than 35 direct flights per day. The average flight time is around 2 hours 35 minutes, and fares start at around 141 US dollars for an economy ticket. Flights to Tibet from Shanghai run around 5 times a day, and take between seven and nine hours to make the 3,000-kilometer flight to Lhasa. However, only two flights are direct, with the rest making stopovers in Xi’an or Chengdu. Costing from 3,360 yuan for an economy ticket, it is much costlier than taking the train. 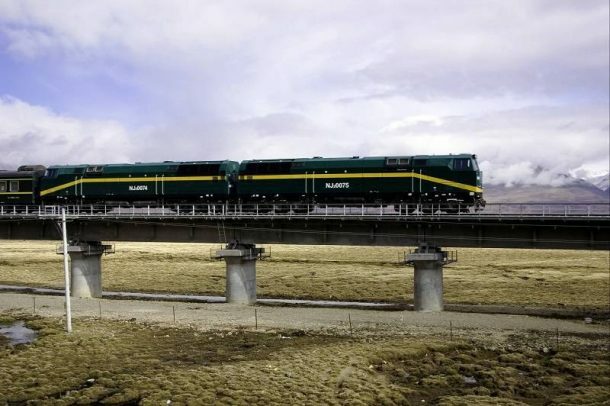 The train to Lhasa from Shanghai takes around 46 hours to traverse the 4,373 kilometers to the Tibetan capital, crossing eight provinces of China along the way. Trains leave Shanghai daily for the plateau, and cost just 793 yuan for the hard sleeper berth, the cheaper option of the two classes. Lying in the Sichuan Basin, Chengdu is one of the most popular locations from which to travel to Tibet. With limited options for trains to Chengdu, it is easier to take a flight to the panda capital of Sichuan Province. There are seven direct flights to Chengdu daily, which cost from around US$ 387 for an economy one-way ticket on this 2-hour 35-minute flight. Flights to Lhasa from Chengdu are mostly non-stop, with over a dozen direct flights per day, and more than 20 indirect flights. The distance from Chengdu to Lhasa is around 1,286 kilometers, and the flight takes two and a half hours to reach the Lhasa Gonggar International Airport. Costing around 1,850 yuan for an economy flight, it is one of the cheaper options for flights to Tibet. Chengdu is also one of the seven gateway cities to get to Tibet. It is one of the most popular of them all. Trains to Tibet from Chengdu take around 36 hours to get to the Tibetan capital, crossing over 3,000 kilometers of Chinese countryside through Xining to get there. However, as popular as it may be, trains from Chengdu only leave every other day. For six months of the year, the trains depart on the odd days in the month, (1st, 3rd, 5th, etc. ), while on the other six months, they depart on the even days. Hard sleeper berths start at around 627 yuan, around one-third of the cost of the flight, though the first-class option, the soft sleeper, costs almost a thousand yuan. 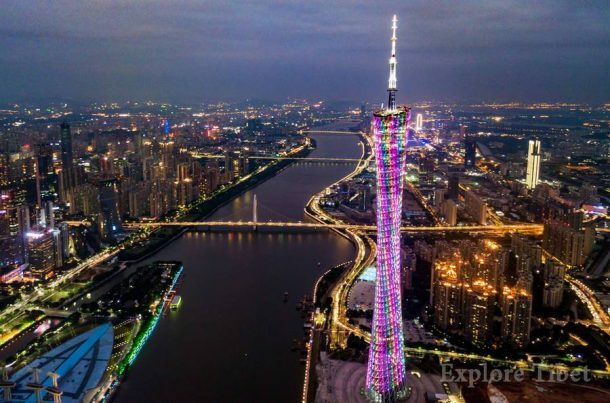 Despite being a major transport hub in central China, there are only three flights per day from Hong Kong to Xi’an, one of which is connecting through Guangzhou. The two direct flights take around 3 hours 35 minutes to reach the Xi’an Xianyang International Airport and cost from around 200 US dollars for the economy flights. While Xi’an is not one of the seven gateway cities to Tibet, trains from Shanghai and Guangzhou stop in Xi’an on the way through. If the trains are not full, then it may be possible to get a ticket from Xi’an to Lhasa, but this is not advisable due to the high demand for train tickets from both Shanghai and Guangzhou. The section to Lhasa from Xi’an takes around 31 hours to travel the 2,864-kilometer journey, and cost from 611 yuan for a hard sleeper and 969 yuan for the soft sleeper berth. There are only four flights per day from Hong Kong to Chongqing, run by Air China, Cathay Dragon, and Hong Kong Airlines. Flights take around 2 hours 35 minutes to get from Hong Kong to Chongqing and cost from around 170 US dollars for an economy flight. Flights to Lhasa from Chongqing Jiangbei International Airport run ten times a day for the direct flights, with around 12 indirect flights that stop in Kunming and Xining en route to Lhasa. A distance of over 1,500 kilometers as the crow flies, the direct flights take around 2 hours 50 minutes to reach the Tibetan capital at a cost of around 1,890 yuan for an economy ticket. Chongqing is another of the seven gateway cities to Tibet, and trains run every other day to the Tibetan capital, with half of the year running on the odd days of the month and the other half on the even days, the same as from Chengdu. Trains take around 35 hours and 30 minutes to reach Lhasa, covering a distance of more than 3,000 kilometers. Soft sleeper berths are more expensive at 997 yuan, while the second-class hard sleeper berths cost just 627 yuan.